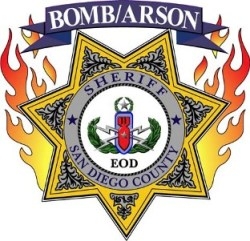 December 5, 2014 (Valley Center) – A bomb threat e-mailed to an NBC news station threatened to place explosives targeting San Diego Gas & Electric Company work trucks over a land use dispute in Valley Center. Sheriff’s Bomb and Arson investigators shut down the Spearhead Trail area for two hours yesterday afternoon to assure that it was safe. Subsequently, deputies arrested Frits Versteegh, a nearby resident who sent the threatening email, said Sergeant Jeff Lauhon.